This is a lovely example of Whall's "innovative, expressive style" (Cormack), in which his daughter Veronica might have had a hand, as she so often did — although their partnership was not yet a formal one. It would become so only in 1922. What is particularly appealing here is the way the sky reaches down from the tracery to become part of the composition below, and enhance its symbolic meaning. Scattering the silvery stars and streaking the deep blue with strong rays of slanting light, this great glorious sun shines right above the victor's crown held by the two young angels in the middle. Closer view of the figures. The angels on the left hold palm branches, their heads bowed in sorrow. The solitary one on the right kneels at the foot of the cross, face in hands, evidently weeping. But the focus is on that central pair, one of whom faces directly forward, and the hope of ultimate victory over death. The words, "Howard Lock Harries's parents, the gift, (in?) love and gratitude" can be seen inscribed on the panes just below. Cormack, Peter. 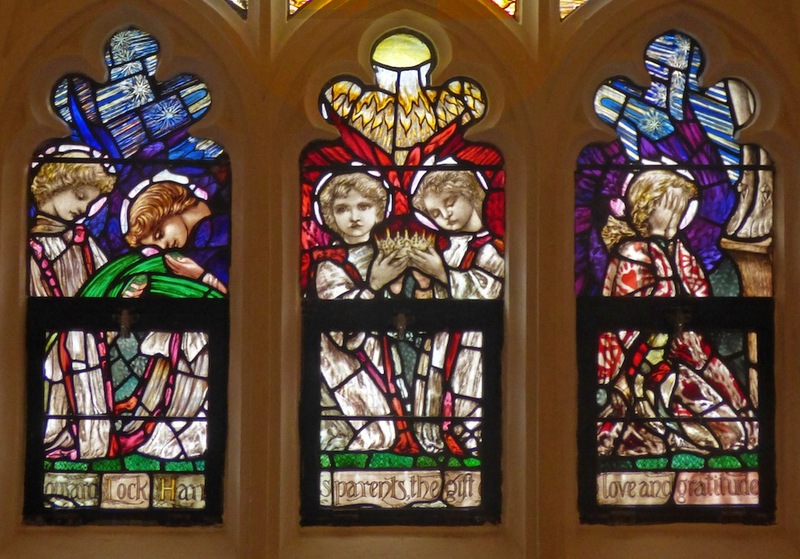 "Whall, Christopher Whitworth (1849–1924), stained-glass artist and craftsman." Oxford Dictionary of National Biography. Online ed. Web. 2 October 2016. Crampin, Martin. 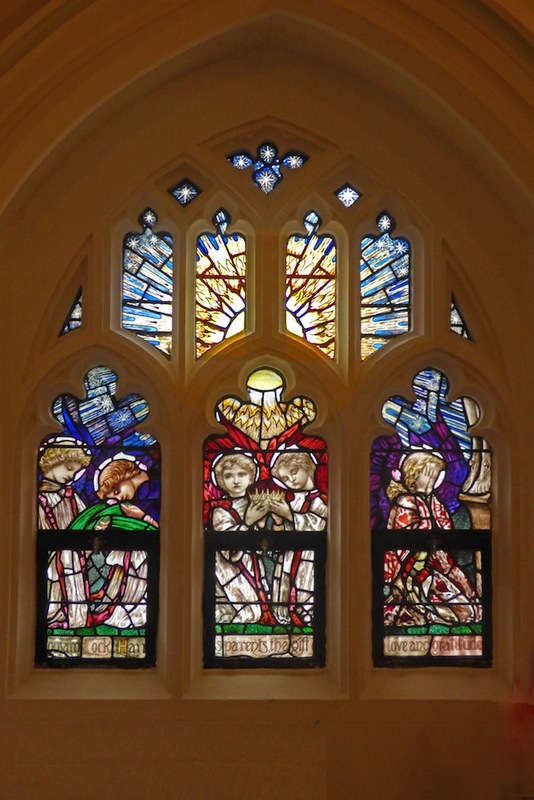 "War Memorial Window." Stained Glass in Wales. Web. 2 October 2016.